Those friendly remixing fellows at Overclocked Remix have announced they have teamed up with SEGA Europe and have launched a Mario & Sonic At The Olympic Winter Games competition. But not just ANY competition, mind. 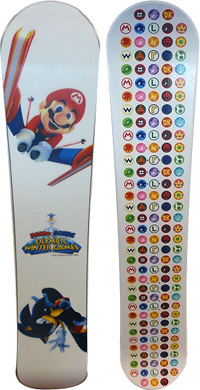 Oh no, djpretzel, Liontamer et al have gotten their hands on one of the super-duper rare Mario & Sonic At The Olympic Winter Games snowboards! All you need to do to win this fantastic prize is to be a bit creative and come up with the name for a brand new snowboard trick using either SEGA, M&S or OCR as a basis (I wonder who came up with that idea? *Cough*)… oh and sign up for their YouTube account. The prize is available worldwide, so if you fancy owning a truly rare pieste, sorry piece of Sonic merchandise head on over to their special competition page!